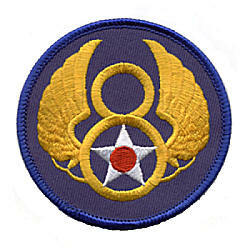 306th BG (H) crew photos (B-17, 1st Combat Wing later 1st Air Division) 1942-1945. 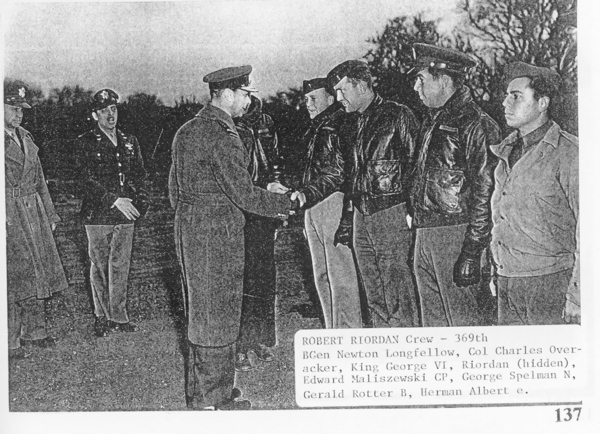 Robert Riordan crew of the 369th Squadron 306th BG(H) with King George VI at their airbase in England. Above is as it appears in the book. The same image of Riordan and England's King George VI after spending 5 MINUTES in a digital image program running through some clean-up filters. This is broken up into multiple PDF files arranged just like the book by PIC (Pilot in Command). A crew was always referred to based upon the pilot's last name. PDFs 1 to 9 includes from 6 to 10 crews per PDF, PDFs starting with #10 onwards are grouped in batches of 20 crews per PDF in 10 page groups. PDF sizes range from 1 to 3 Megs and all images are at 72 DPI for web viewing. Original high resolution PDFs (scanned at 300 DPI) can be ordered from the Chapter Secretary for $10. Two thirds of the way through the book (in the PDF #15) it restarts again with crew names from the beginning of the alphabet. Part 20 Alphabetical listing of combat crews without known photographs and the back cover photo of the group in formation. Toth Thomas crew loss report. 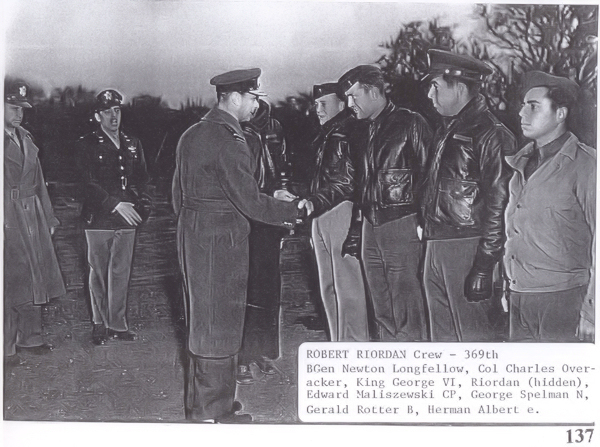 Debriefing notes from Lt Howard Roth after the Ruhland mission. All images and documents © Copyright 2015 by Oregon 8th AFHS unless otherwise noted.